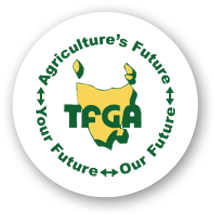 We are very excited to announce a partnership between the Tasmanian Farmers and Graziers Association (TFGA) and Farmware. As Farmware is a grass roots company with an app designed by a farmer for farmers, we are acutly aware of the importance of organisations such as the TFGA in providing representation for farmers. So to give TFGA members an extra incentive we are providing discounted subscriptions. So if you are a member you are entitled to 10% off your Farmware subscription. Farmware is free for the first month so Click Here to try farmware and make a positive change to your farm system with the farmware farm management app. Find us on Facebook or Twitter. "Farmware looks good and works very well... found it easy to work out how to operate it and has great detail... no more running to spray shed to see what we have"